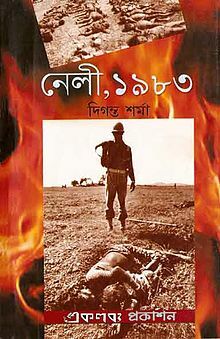 Guwahati,Shazida Khatun,Main Uddin,Waliullah Ahmed Laskar: Nellie, 1983 is an Assamese book written by Diganta Sharma based on the Nellie massacre that took place during the Assam Movement in 1983. The book is published by Eklabya Prakashan, Jorhat, Assam. ‘Rabia Begum was feeding breast to her 17-month daughter sitting in a stool in the veranda of her roadside house. Her other children were playing in the small courtyard. Her husband Chandeh Ali was busy with some work in the back side of the house. They did not even guess what was to come to them after a few minutes. Suddenly the playing children rushed towards their mother in a panic and grasped her. Already there were hue and cry around their house. Hearing desperate cries of his children when Chandeh Ali just entered the courtyard he saw a group of people around with swords, daggers, knives, tridents and petrol. Attackers got divided into three groups. One group chased running Chandeh Ali. Another group went to set fire on the house. And the other group started striking their weapons on children in the in mother’s lap. In minutes they were transformed into a heap of human limbs. The house was rendered into an ash-heap. And Chandeh Ali? A trident struck him from behind.This is not a scene of a horror movie. These are the words from a chapter in the history of the independent secular socialist democratic republic of India which was written in some unknown villages in Nellie in the then district of Nogaon in Assam on Friday, 18 February, 1983, by workers of All Assam Students Union and All Assam Gono Sangram Parishad, the chauvinist groups of Assamese people, with the blood of more than 3000 Bengali speaking Muslims. gets sometimes wilder than the wildest. This is one of the situation where human beings are at their worst. It reminds one of Auschwitz. Birkenau. And such other hellsin the earth. Nellie 1983 is one of the most horrendous genocide in the earth.This book which can strike vigorously to the core of your concept of humanity was are sult of painstaking investigation and an example of meticulous objectivity and bold journalism. The author Diganta Sharma, a young journalist with Guwahati based Assamese weekly Sadin. on 18 February. Agenda was genocide to save the existence of mother Assam. Placeof carrying out the plan was Nellie”.The result was genocide of the worst kind in the history where more than 3000 people died and 14 villages were burnt and smashed into smithereens in a mere 6/7 hoursspan of time. After the massacre the victims who survived were so traumatized thatthey could not think of getting justice, rehabilitation and compensation. No ex-gratia was paid to any body in connection with the massacre. All cases of 688 were dropped.A commission of inquiry was formed known as TD Tiwari commission to enquire in to the massacre, the report of which was never made public.The victims of Neelie are getting awake and thinking to seek justice. They ask now“why the nationalists could not prove us Bangladeshi within the period of 25 years since the massacre which was carried out to free Assam from foreigners. Even if they can now prove it we will leave this country on our own”.Diganta Sharma was able tomake the genocide to haunt its perpetrators once again.Victims and some other groups are contemplating to go to the Supreme Court and use the book as a piece of evidence. Dr.Debabrata Sharma, on behalf of Ekalabya, the publisher of the book in the introduction compared the Assamese chauvinist mind-set with that of Lady Macbeth when she says“A little water clears us of this deed” before the publication of the book. Now, after the publication they wonder “All the perfumes of Arabia will not sweeten these little hands” like Lady Macbeth..‘Nellie, 1983’ cries for actions to wash the hands. It needs justice. Nothing short of justice would do. Read it. Be ashamed. Be afraid. It was one of our great shames which came first of many such. Delhi, 1984. Mumbai, Gujarat. What is in stock for the next days who knows? So read it. Be haunted. And take actions. Take actions to get justice for the victims. Police filed 688 criminal, of which 378 cases were closed due to “lack of evidence” and 310 cases were charge sheeted, and all these cases were dropped by Government as a part of Assam Accord and as a result not a single person got punishment for killing 10,000(non official) innocent people. Why Students Pay Writers to Get Their Book Reviews Done?